Preheat oven to 400 degrees F. Spray a baking sheet with cooking spray or brush with olive oil. Generously brush chicken tenders with olive oil and place on prepared baking sheet. Sprinkle desired spices such as salt, pepper, chipotle seasoning, etc. over chicken. Bake for 15-20 minutes, or until chicken is white and cooked throughout and reaches an internal temperature of 165 degrees F. Set aside. Preheat oven to 425 degrees F. Spray a baking sheet with cooking spray or brush with olive oil. Cut tortillas into small strips and place in a bowl. Add olive oil to bowl and toss to evenly coat tortilla strips. Add desired seasoning (salt, pepper, chipotle seasoning, etc.) and toss to coat. Add tortilla strips in a single layer on prepared baking sheet and bake for about 4 minutes, then remove pan and flip strips over. Bake for an additional 3 or so minutes, or until tortilla strips are crisp and have browned on the edges. Remove from pan and let cool. Add all ingredients over mixed greens or lettuce of choice and enjoy! I used chicken tenders because that's what I had available, but you can for sure use chicken breasts and just cook them the appropriate amount of extra time. The quantity of salad ingredients here are customizable! Add as much chicken, black beans, onion, etc. as you wish! I like to add the remainder of the avocado from making the salad dressing to the salad for serving. 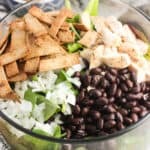 Nutritional info is estimated for 1 large chicken tender, 1 1/2 cups of mixed greens, 2 tbsp black beans, half a tortilla worth of strips, a sprinkling of onion, and a tablespoon of dressing per serving. Though values will vary depending on your serving sizes.